The Easter holidays are almost upon us and whether you are going away then, or in the summer, you may already be considering what to pack. Travelling with kids can make this decision a little harder due to factoring in keeping little people occupied on the journey to your destination. One of my favourite tricks is to buy lots of stationery bits from Home Bargains, wrap these up and gift them on the plane. It takes time to open up each item and it’s exciting for children and keeps them engaged. I’ve already started stocking up for our holidays with this super cute notebook that I know Liv will love as a new holiday journal! I am sure we all use food as a bribery tool and having snacks on you at all times is paramount. However when space is a consideration, something in a small packet, that is tasty and healthy is a bonus. Let me introduce Fruit Bowl Strawberry Flakes. The small jelly like flakes are part of your one a day and contain no added sugar. They are fun to eat and ‘actually taste quite nice’ according to Liv. Having a few packs to hand will certainly keep children happy! There are lots of flavours available in the range, even yoghurt coated flake snacks and you can pick Fruit Bowl Flakes up in most supermarkets such as Tesco. If you have children, you will know Sudocrem is a must have item! Available in a range of sizes, the Care & Protect cream has many uses! It is in-fact one of my favourite moisturisers to use as it leaves skin feeling soft, supple and well moisturised – if it had anti-ageing benefits, it would be even more awesome! It’s a really handy cream to use when flying as air travel tends to dry out your skin, but use this to step off the plane glowing at your destination! Available to buy from Boots. Not only do you want to arrive at your destination fresh faced, but also with fresh breath! The Swish To Go sachets are perfect for adults travelling as they are small, but pack a punch for minty fresh breath! The quick dissolving powder turns into liquid as soon as you pour the powder onto your tongue, then simply swish around your mouth for ten seconds and swallow. You will be left with cleaner teeth, healthier gums and fresh breath. I recall spending most of my time trying to find chewing gum at Manchester Airport in the late 1990’s, only to find out sale of gum was banned in the terminals, Swish To Go would have been seriously handy back then! Available from the Swish To Go site or Boots. I am a huge fan of roll on suncream for children, it really does make life so much easier… and cleaner! As the SunSense Kids Roll On is Factor 50, giving you peace of mind that your children are protected from the sun’s harmful rays. At 50ml, it can be taken in your carry on, in a clear plastic bag to pass airport liquid regulations of 100ml or less. The SunSense range is fantastic and includes creams for those, like myself who are concerned about the skin ageing risks when out in the sun. The Factor 50 lip balm is amazing, I absolutely love it! I have been using this every day, even in the snow and my lips have been left thoroughly moisturised and soft. Your lips can chap too when in the sun, do don’t forget to look after them with suncream too! Currently, if you buy two products from the SunSense shop, you will receive a lip balm for free! I do like meal kits that make your life easier and Little Cook Box meals are no exception, they are absolutely amazing! We will move onto the food in a second, because you may be wondering why I have included them in a post about items you need when travelling with kids… That’s because, Little Cook Box deliver the meals wherever you need them delivered, also offering free delivery! Perfect if you are travelling to a holiday destination in the UK, especially as it takes the hassle out of ensuring food is available when you arrive. What’s more… the meal kits are perfect for children to help you make their meal too. Everything is laid out perfectly, the instructions are very easy to follow and the quantity of food is very filling. The site is well laid out and engaging, making it easier for children to choose which meals they would prefer to eat. Details include allergen information and the shelf life, because all the food is fresh. I was pleasantly surprised when we made the Chicken Goujon meal kit, even the lettuce was still fresh and the finished, cooked meal was very tasty according to Liv! There is a good selection of meal boxes for all tastes on the site, starting from a kit with 4 meals for £19.80 (£4.95 per meal), the more you order the cheaper the meal kits work out. I always wrap gifts up for mine to open on the plane too. It makes such a big difference on the journey. We are travelling on a plane with the kids in June and I’m already dreading it! Great tips here and the stationery is one I’m stealing! Oh that meal kit looks great. We have nothing like it available in Portugal and I just know it would come in handy when travelling with our son. I do wish Portugal would catch up sometimes! Totally with you on packing loads of snacks and little presents for them to open. I also find sticker books entertain my children. 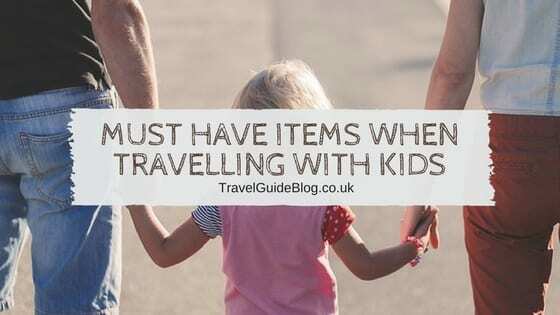 Fantastic items, I remember when I travelled with my little one I made up a whole bag of stuff like a pad and pens plus some snacks. I really love the idea of roll on sunscreen, definitely checking that out. Those little meals look brilliant! Travelling definitely seems to be getting easier the older they get. Pads of paper and pens are a must-have now for us. And interesting little things to open like snacks and small nic-naks. We’ve been travelling a while now and we use Sudocream for so many things. Mosquito bites, Mr. C’s sunburn, cuts, scrapes, rashes and it was great for when the boys caught chickenpox in Bangkok! Definitely a must have item when travelling with little ones in tow. Very good to knows I will try to remember these for the future. I could do with those little meals for travelling with my other half. It’s like traveling with a child sometimes! We leave for our first ever family vacation right after Easter. Not looking forward to the packing. I’ve been planning for months and the food/snack issue has be pretty worried! Sweet Girl will eat 24/7 if she’s permitted. Great tips here! Going away in November for our first trip abroad so must remember these! Especially love the roll on sunscreen, had no idea they even made this! What a fab idea to wrap up presents! We are looking to fly for the first time with our three in December and it’s such a fab tip! Some great tips here! I also buy little bits for my girls before travelling, so I love the idea of wrapping them up as gifts! This will be really exciting for them, and can act as a bribery tool to be good on the flight.